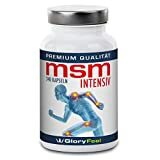 The highly dosed MSM Intensiv capsules from GloryFeel contain 1600mg of organic sulfur powder (methylsulfonylmethane) per day dose, enriched with 24mg of vitamin C and 16.5μg of selenium. This corresponds to 800mg MSM, 12mg vitamin C and 8,25μg selenium per capsule for a daily consumption of 2 capsules. 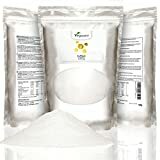 Sulfur is an indispensable mineral element of human metabolism. MSM is an organic sulfur that we absorb through plant and animal food. Sulfur is essential for most of our metabolism. A balanced sulfuric acid is of great importance to the body since sulfur deficiency can lead to serious problems such as joint pain, dyspnoea, dry skin and brittle hair. The cellulosic capsules are suitable on purely vegetable-based and therefore perfectly suited as a complement to a vegetarian and vegan diet. 4 month stock – 240 MSM capsules cover the requirement of 30-day sulfur treatment according to consumption recommendation. At Gloryfeel, we attach great importance to the best quality and natural active ingredients. Our MSM Intensiv capsules are produced in Germany under the highest quality standards and tested by an independent accredited testing laboratory. Trust MSM Intensive of Gloryfeel because: WE WANT YOU TO FEEL GOOD – GLORYFEEL.